With 19 gardens, 17 museums, 13 recreation venues, 9 performing arts arenas, 9 various attractions and play spaces, restaurants, dog parks and trails, San Diego’s Balboa Park offers something for everyone. Balboa Park’s land has been set-aside for almost 150 years and has racked up quite the array of family-friendly activities. Beginning in 1868 as City Park, the land now home to San Diego’s most epic green space sat idle for more than two decades before the first beautification projects began. Known as the Mother of Balboa Park, it was Kate Sessions who first offered to plant 100 trees a year and donate foliage within the park’s boundaries in exchange for a small portion of land to be used as her nursery. Beginning officially in 1903, beautification plans finally went into full effect. Roads, water, planting and construction surged into high gear, setting the stage for the space we enjoy today. To honor the exploration success of the Spanish-born Vasco Nuñez de Balboa, Balboa Park took its official name in 1915. With the commemoration of the opening of the Panama Canal, the Panama-California Exposition from 1915 to 1916 in Balboa Park created the focal point and incentives for the park in the center of America’s Finest City. Early museums and grounds took shape amidst the creation of today’s Balboa Park. By the Second World’s Fair, the California Pacific International Exposition from 1935 to 1936 was designed to boost the economy by adding infrastructure, landscaping and other cultural organizations to the already existing grounds of the park. During World War II, many of the park’s buildings became part of the Naval Hospital. Using houses as dormitories, ponds for rehabilitation pools and museums to house the sick, Balboa Park did its part to assist in the war efforts on the home front. A Smithsonian Institution affiliate, this museum houses a collection of space and aircraft from around the world. With exhibits and artifacts showcasing heroes of the sky such as Lindbergh, Earhart, Armstrong, Aldrin and the Wright Brothers, with each visit guests embark on their own journey through air and space. Check out the flight simulators and 3D movie theater along with a replica of the Spirit of St. Louis, true GPS satellites and a module spacecraft from Apollo 9. The world-renowned San Diego Zoo takes up a huge portion of Balboa Park. With animals from the world over, visitors can delight in learning about various species and their lifestyles. From pandas to giraffes, orangutans to elephants, giant tortoises to tiny meerkats and all in between, the animals and keepers of the San Diego Zoo share their stories daily. Complete with venue spaces, educational programming and summer late night hours, this world-class zoo is open to animal lovers of all ages. Home to studios, galleries, craft stalls and more, this art lover’s haven nestled in between the San Diego Zoo and the Natural History Museum is a maze of artistic delight. This unique region of the park revels in art all year long. For more than eight decades, this charming cobblestoned village has been a destination for artists of all kinds. This community of talented artists awaits visitors to Balboa Park and the artists in residence are thrilled to share their talents, creations and stories with all who enter. Situated in the heart of Balboa Park, this outdoor organ pavilion holds up to 2,500 people. With countless entertainment spectacles since 1914, this first of its kind outdoor organ (and largest in the western hemisphere) has been wowing guests for years. All concerts are free and open to the public. Bring your chairs and blankets, picnics and snacks to take in the music of the evening under the San Diego sky. Its mission is to “preserve, strengthen and advance American theatre.” The Old Globe puts on both outdoor and indoor performances year ‘round. Take in Shakespeare in the open-air theater or Dr. Seuss’ How The Grinch Stole Christmas inside. You’ll be amazed at the complexity and diversity of performances and the talent of the artists and performers. Whether you spend an afternoon in the outdoor plaza or an evening with actors of the stage, the talent of the Old Globe Theater is bound to bring out your inner artist. The House of Pacific Relations International Cottages aim to “promote multicultural goodwill and understanding through educational and cultural programs.” Over 30 countries are displayed in historic cottages within the area. Every Sunday, the houses open to share their history, traditions, programs, music, food and drink with visitors from around the world. Volunteers man the houses and share their own stories along with those from the country they represent. Food and culture are also showcased at large scale events like Balboa Park December Nights and the annual Ethnic Food Fair. Old Town Trolley is a convenient way to explore Balboa Park while maximizing your vacation time. Explore the many attractions Balboa Park has to offer, such as the San Diego Air and Space Museum, the San Diego Zoo, and much more! With stops throughout San Diego, you can hop on and off at the sites you want to visit and learn about the rest during our fully narrated historic sightseeing tour that’s just under two hours. Find the lowest price and money-saying packages by purchasing tickets direct through our website. There are welcoming neighborhoods situated on all sides of the park. Head into North Park for an evening filled with food, fun and entertainment at their many restaurants, pubs and bars. Check out the community of Hillcrest for a cupcake tasting at Babycakes or an organic foods shopping spree at Whole Foods Market. Venture into Banker’s Hill to find the European-style Café Bassam offering an incredible assortment of loose teas and a unique coffee experience. 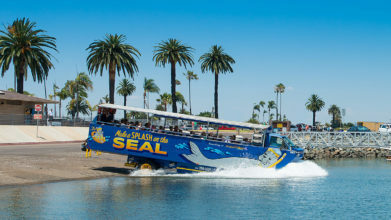 Or journey into San Diego’s downtown for the restaurants of the historic Gaslamp Quarter and the views of San Diego Bay from the Embarcadero. During the spring and summer seasons, take in a baseball game in the East Village’s Major League Baseball stadium, Petco Park.